This begs the questions: How many color combinations are there? What (if anything) do they signify? I’ve added a new page which includes a gallery of Heart of America Council CSPs. Special thanks to Jody T. and Ryan M. for providing some of the images. As you can see, I am missing scans of three CSPs. If you have these issues, please send me a scan (preferably with a white background). You can send the images to me a this email address. Also, if you see anything that needs to be corrected/added, please feel free to contact me. In response to my previous post, Matt P. tipped me off to a recent eBay listing that shows both the original and reproduction 1958 NOAC pocket patch. The second page has a good view of the front and back of the patch. 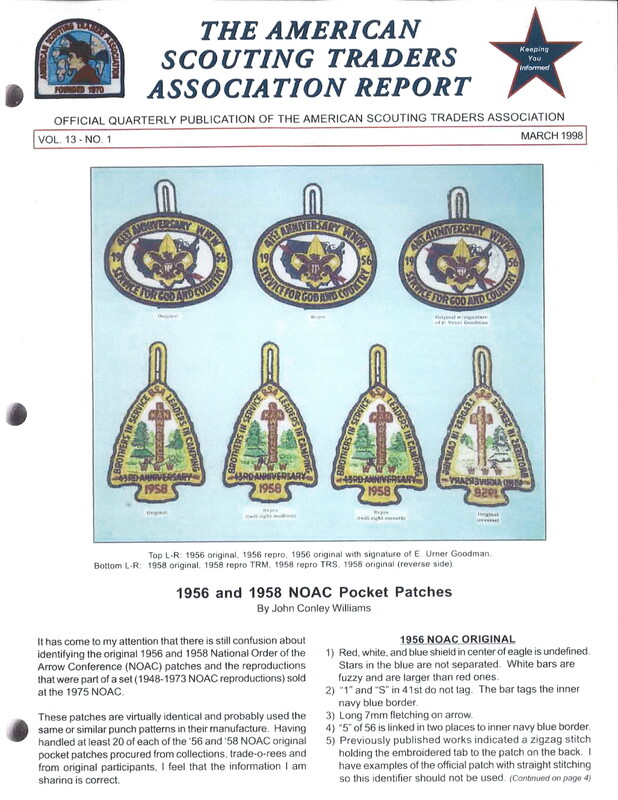 1958 NOAC Patch – Original or Reproduction? 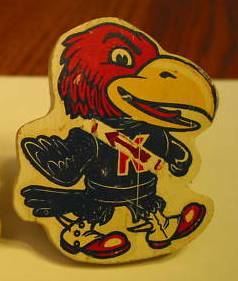 Given that the University of Kansas in Lawrence, Kansas was the site for the 1958 National Order of the Arrow Conference (NOAC), it is only right for Tamegonit/Kansas OA collectors to add a 1958 NOAC pocket patch to their collection. The question is: when you find one, is it an original or a reproduction? 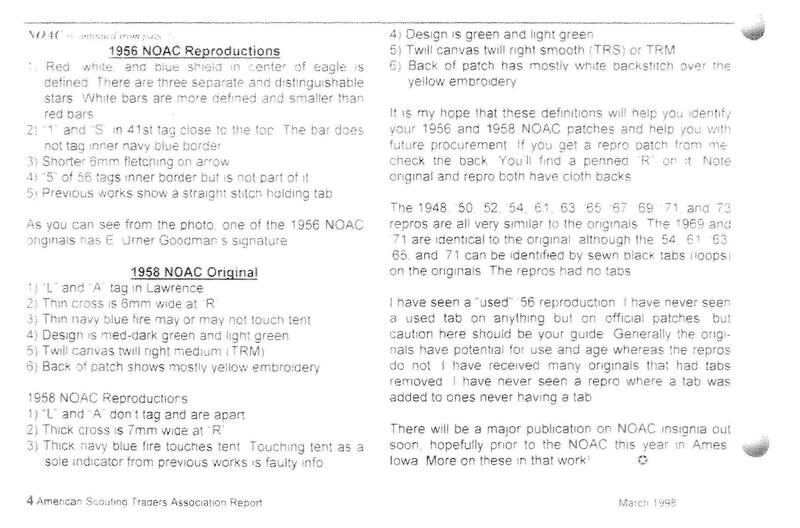 The following images are from the March 1998 American Scouting Traders Association Report feature article by John Conley Williams which provides some guidance on how to differentiate between the original and the reproduction patches. The article notes that the reproductions were sold at the 1975 NOAC. If I dig up a scan of the real and original, I’ll post those as well. Thanks to Gene T. for the article scans. Original or reproduction, I’ll leave you with this image of a neckerchief slide I spotted on eBay a while back…a Univeristy of Kansas Jayhawk wearing a brotherhood sash. When are Vigil nominations due?